We grow seedless Washington or Bahia navels grafted from the original parent tree imported from Brazil in 1870. Recently we've planted additional citrus varieties; Meyer Lemon, Persian Lime, and Satsuma Mandarins which seem to be establishing hearty roots and have produced a small amount of fruit this season. Our favorite way to preserve a portion of the harvest (eating aside) is by juicing. My husband takes charge creating an assembly line and we wash, cut, juice, and bag gallons upon gallons. It freezes quite well and always feels a little luxurious to have homegrown fresh squeezed juice throughout the year. Based on our years of experience this juice press works the absolute best! Perhaps one day we'll splurge on a fancy automatic machine. I know many of you are experiencing sub zero temps and endless gray skies. To cheer you up I'd like to send you a dose of California sunshine! I'm giving away a box of hand picked oranges from Grove House to 5 readers! To throw your name in the hat, leave a comment sharing your favorite citrus. It can be the actual fruit, a recipe, a candle or fragrance, or childhood memory. Anything, as long as it's about citrus! Due to the nature of fresh produce I can only ship within the USA. Winners will be randomly drawn and anounced Friday - January 26th here and on my IG Stories. Can't wait to hear your favorites and ship out a fresh batch of Vitamin C to the winners! CONGRATULATIONS TO THE WINNERS! PS. I loved reading everyones comments! 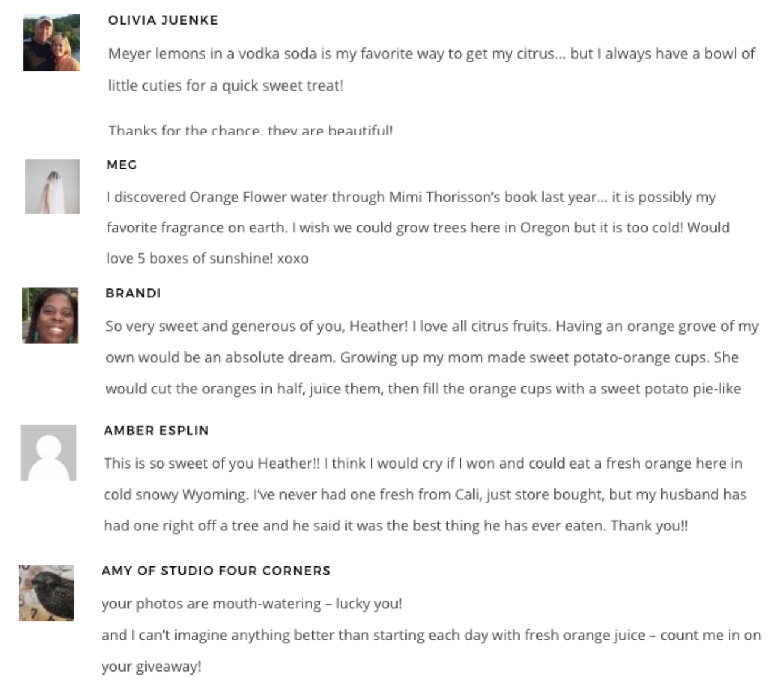 xo, H Please email your address to: hello (@) heatherbullard.com so we can get send your box of Grove House oranges! Older PostThe Academy - France 2018 | Register Now!